Real men like Arnold Schwarzenegger don’t get scared—at least in films like The Terminator in which his never-say-die character is actually so masculine that he is not human. He peels back his skin to reveal that he is not in fact a man inside—he is machine. Real men don’t have a mechanic drive to do their duty, they have feelings, doubts and all the non-single-minded thoughts that make us human. But it goes even deeper than that. The Terminator is not even an animal. That’s why he struggles to feel anything during the film. Even the most basic mammals experience fear in response to a threat. This fear is what motivates animals to take action—fight or flight. A man who experiences fear is just a natural non-sociopathic person; but a man who takes action is a man. When picturing a ‘real man’, a far better choice is John Wayne. John Wayne, the star of the great Western films of the mid-20th century like True Grit who helped define what it meant to be a man in our culture. He was a man of few words, but when he said something he meant it. He rarely revealed his emotions, but when he did, you knew it was serious. 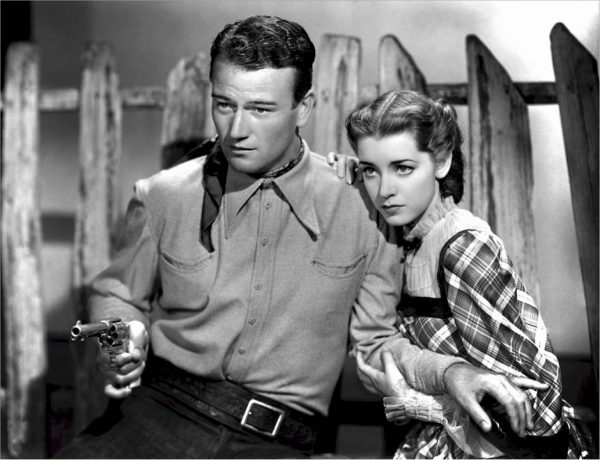 John Wayne’s characters were idealised men, but they were certainly believable ones. He rarely let his face reveal his fear, instead, you could just see his eyes narrow, as he increased his concentration. But you knew he had fear, because the scene before he was sentimentally telling his fiancee that he might not be seeing her again. So much of John Wayne’s appeal is the extent to which he is conscious of the relationship between fear and courage. Fear doesn’t automatically mean low courage. Instead, courage is when you have fear, but you narrow your eyes and try even harder at what you are doing. From what we have just been saying, it seems clear that if you want to be a man, when the adrenaline starts coursing you always pick fight. John Wayne always picks fight. That is another implication of the above quote—that even though your brain is telling you that something is unsafe, that you should do it anyway because you are a man of principle—and courage, honour and dignity are some of your principles. Well if so, then no one is going to tell you that you are not a man. Many men have become legends due to dying horrible and needless deaths. But honestly, if being a man requires this much, then is it worth it? Fight vs flight are the two options available to us in nature for a reason. The availability of the second option of flight opens up an entire range of alternative resolutions to a situation to a man, and some of them are usually going to be smarter, better and more survival-orientated. It’s a bit hard to argue that upholding your dignitity against perilous odds and dying a violent death is not the most manly thing to do, but most men alive today retain some dignity by just backing down, stating how much smarter, better and more survival-orientated this makes them and going back to their families. Stephen King and Ernest Hemingway are both brilliant writers who are known for their masculine writing style and masculine real-world personalities. But, they both have one other thing in common: they drank a lot. Hemingway struggled with alcohol from the age of 15 until his suicide at age 61, and Stephen King had a rampant alcohol and substance abuse problem that reached a head during the 1980’s. Self-destructive behaviour is unfortunately very masculine in our society, which is a reason that both these writers used to justify their habits. King writes that he “employed the world-famous Hemingway Defense… [which] goes something like this: as a writer, I am a very sensitive fellow, but I am also a man, and real men don’t give in to their sensitivities. Only sissy-men do that. Therefore I drink. How else can I face the existential horror of it all and continue to work? Besides, come on, I can handle it. A real man always can.” As great writers, both were very sensitive men, yet being sensitive in itself is not un-manly. John Wayne shows that, when he is repeatedly characterised as having a strong relationship with a wife and children. But, it is that this sensitivity can cause fear that these writers have a problem with. Most recovering male alcoholics will realise the contradiction in the Hemingway defence as I’m sure Stephen King now does. It is that courage means facing fear head-on, taking it like a man and continuing on despite it. Whereas it is less manly to quell this fear not with your own courage, but with a chemical comfort. The ultimate way to prove yourself as a man is of course: success. If you look scared as hell, but you get up, keep going and achieve something fantastic then people will respect that. For instance, if you write about your existential fears like Hemingway and Stephen King and then become an immensely succesful writer, men are going to idolise you the world over. But this kind of conclusion probably does more bad than good. Because success is never assured, and a guy reading this may get more scared by the immense pressure it places on success. So, even without success, the way to maintain your male dignity is to just be your best—and I have never met anyone for whom this is not good enough (except maybe people for whom there were few social expectations for, but who still were respected for doing their best). That means: saddle up anyway, but play it smart, flee if you need to, survive above all and don’t make any excuses for destroying yourself.